One of the goals of our Tripura Foundation’s Ambassador of HoPE Trip is to spread love and compassion in a practical way to the less fortunate children in India. During our Tripura Foundation’s Ambassador of HoPE Trip, trip attendees (who are our Ambassadors of HoPE), will be distributing HoPE gift packs to the boys and girls in the HoPE Centers that we will be visiting. I would like to invite you to sponsor an amazing HoPE Center Gift Pack for just US$10 (S$12.70). Why is this particular HoPE Center Gift pack so amazing? 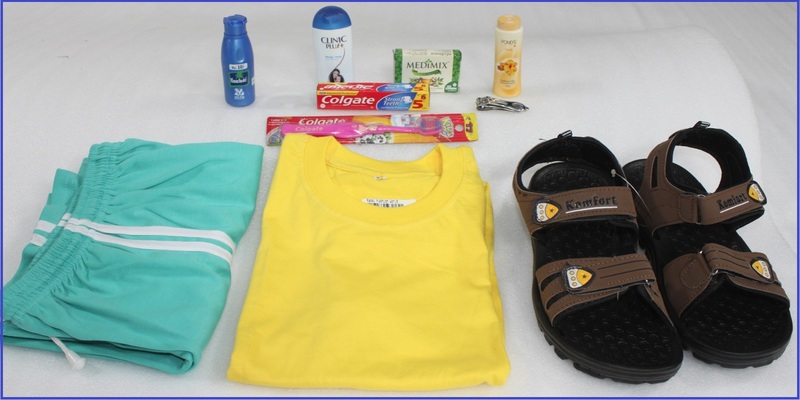 For just US$10, you can clothe and take care of one (1) HoPE Center child’s basic needs for several months – your HoPE Center gift pack contains daily essential items (which we take for granted) but which a poor child could never dream of owning! I was amazed when the good people at Tripura Foundation were able to put together such a wonderful blessing for each child for just only US$10! These items will take care of them for months to come! How Can I Sponsor a HoPE Center Gift Pack? During our Ambassadors of HoPE Trip to India next week, our Ambassadors of HoPE will be distributing your HoPE Center Gift packs to about 140 HoPE Center children. You can also make a donation in any amount and designate it to “HoPE Ambassador Gift Pack” under the drop down menu. We will pool all donations received and purchase the equivalent number of HoPE Center Gift packs for the HoPE Center children. After our Ambassadors of HoPE Trip to India next week, I shall post pictures of happy HoPE Center children receiving your HoPE Gift packs!